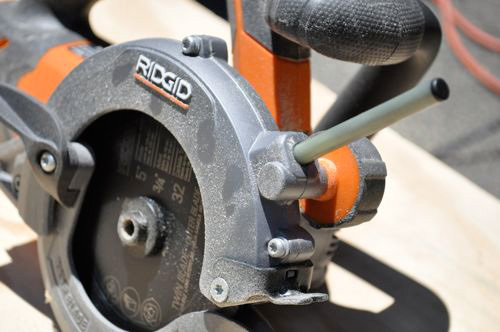 The Ridgid R3250 Circular Saw is unique among circular saws in that it has two blades that spin in opposite directions. This affords some great advantages like easy plunge cuts and being able to cut forwards and backwards. 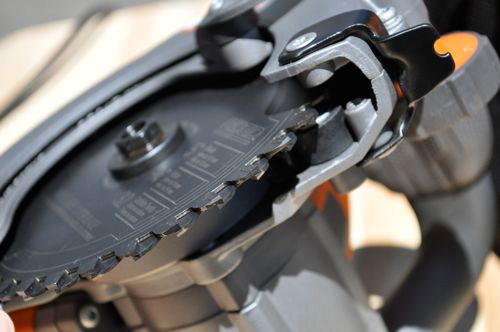 The twin blades also reduce kickback, and enable you to cut a variety of materials. Despite its amazing versatility, the R3250 can only cut 1-1/32” deep. This is on par with competitors, but means you can’t get rid of your other circ saw. Read on for our review. For even more pictures check out our Facebook album. 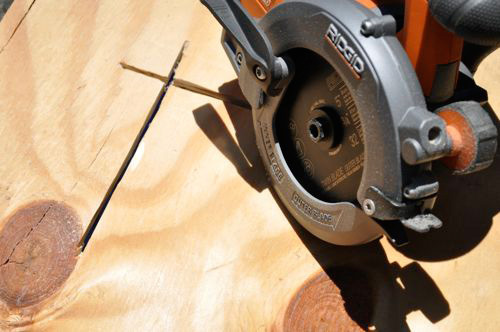 The R3250 has some important differences from your typical circ saw. The first thing you’ll notice is the lack of a shoe (you know, that bottom plate that slides over the material). Instead of a shoe, there’s a small guide in front of the blade. Take some practice cuts to get comfortable. You should also keep in mind that double the blades, double the kerf. This is of small concern, but good to know. 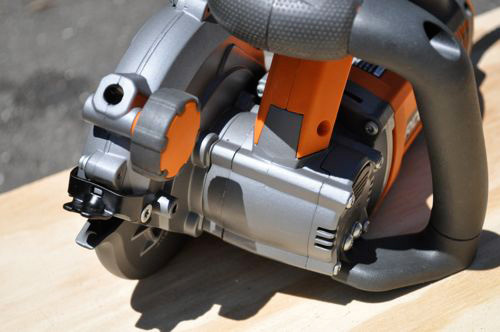 The 10amp, 5,500rpm motor provided plenty of power, and cutting was exceptionally smooth. I really enjoyed how easy it was to make plunge cuts and the unnatural feeling of cutting backwards. There was no kick-back; and I didn’t try to persuade the saw to generate one. Every cut was nice and clean with minimal tear out- another perk of the twin 5″ blades. The R3250 is also able to cut through a variety of materials like wood, plastic, pvc, plexiglass, aluminum, copper and steel without blade changes. The only caveat is that you should utilize the wax sticks for cutting soft metals. The two blades are not interchangeable. The inner blade is keyed with three offset pins making it easy to orient. The handy arrows on the blades and lower guard are also dead giveaways (for those that skip the manual). I mentioned before that the R3250 features a 1-1/32″ depth of cut. In addition, there’s no depth adjustment. I like the long, 10′ cord as that’s something you won’t always find. The design is comfortable and balanced, and lefties will appreciate the ambidextrous front and rear handles. The auxiliary handle is also a welcome addition. 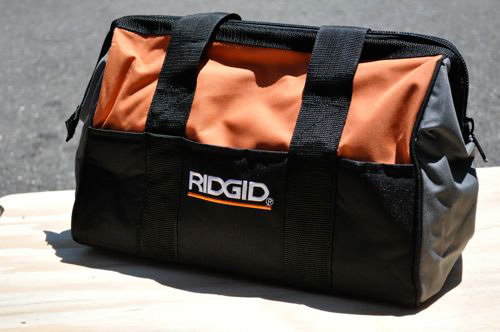 Every Ridgid tool I’ve seen comes in a heavy duty contractor bag. There’s lots of debate over bags vs. hard cases and arguments for both sides. I like hard cases, but that wouldn’t keep me from making a recommendation. Includes: R3250 TwinBlade Saw, Inner Blade, Outer Blade, Blade Wrench, Heavy-Duty Contractor Bag, 6 Wax Sticks, Side Handle with 3 screws and Operator’s Manual. 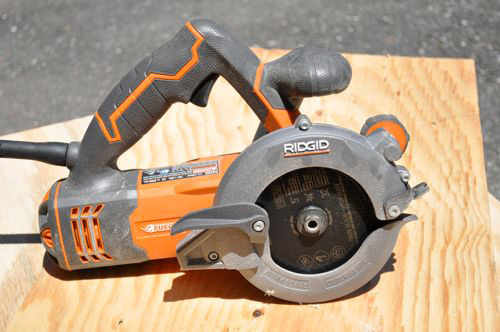 Have you guys used any other dual-blade circular saws to compare to this one? What’s the gap between the blades (how wide is the kerf made by the blades and the space between)? What other blade options are there, and did you test the stock blades on any materials than wood? I’m curious about the quality of the cut and the life of the blades when cutting harder materials. Is it possible to remove one blade for a narrower kerf, or to spread the blades apart for a wider kerf? Does it really? If it does cut any of these materials, how thick? How long will the blades last? How much are new blades? And a note to William in the previous message; I read the owners’ manual online and they say NOT to use it with a single blade. And I doubt you could mount the blades if you tried spacing them significantly farther apart. It doesn’t appear there’s any cutting guide on the BACK of this saw, which is able to cut BACKWARDS as well? These saws are designed for demolition work – cutting an old fiberglass tub in half , cutting metal channel, or cutting rust out of car, etc. 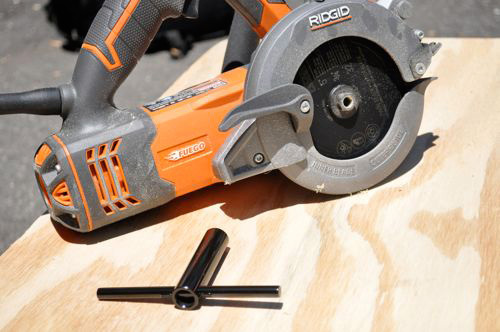 For something like that – it’s faster, quieter, and much safer than trying to use an angle grinder or a regular circ. saw with a metal-cutting blade. 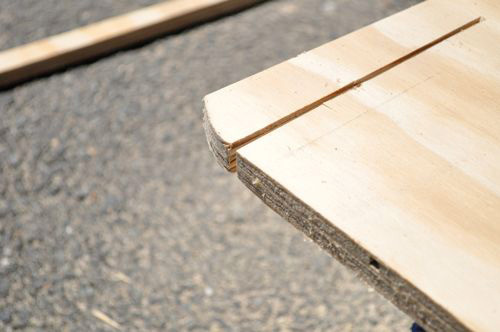 They are NOT designed for carpentry and do relatively poor job cutting wood or sheet goods. With no foot there is nothing to align your cut to and there’s nothing to keep your cut 90 degrees to the work. There is no depth stop – you’re essentially hand-guiding the saw – no good. The tool should be marketed as a demolition tool – then people would understand its strengths and limitations. 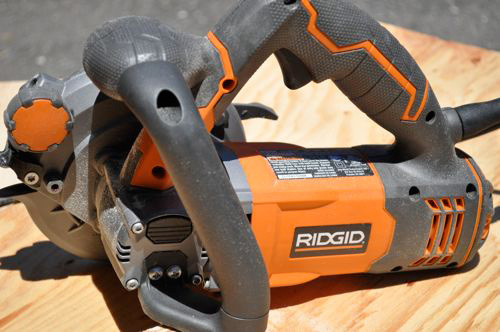 Bottom line – if you do a lot of demo / knock-down you should have one of these in your truck – but it’s NOT a replacement for a conventional circular saw. PS – people asking about mounting the blades farther apart, etc. totally don’t get it. The two blades spin in opposite directions and any space between them is just for clearance of that mechanism. Not only can’t you re-position the blades – you can’t even interchange them. They are each designed to fit on the saw a certain way. The counter-spinning blades let you cut any which-way.. forward/backward/in an arc, etc. with no fear of kickback and very little sparking like you’d have with a grinder. The lube stick is not optional – it’s required when cutting metal. Whoever posted that you should spray the blade with dry lube is way off-base. What you should do is use the tool as-designed and use the lube sticks when you’re cutting metal, etc. To my understanding, this tool was designed by a fireman/rescue worker who needed to quickly cut into stranded vehicles to get the occupants out. It’s designed to chew through a bunch of different materials quickly and with no kick-back. (conventional circ saw) very little sparking (grinder) … and much faster (and without all those blades) than a recip saw. It’s not designed to cut boards or even plywood for that matter. 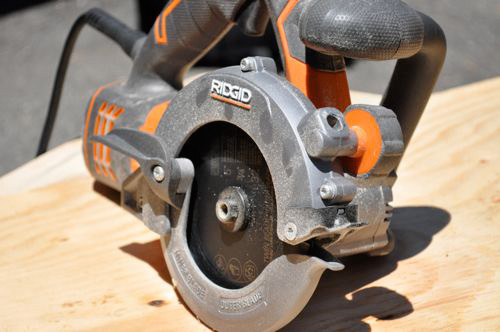 Ridgid is not doing anyone a favor by trying to position this as a general DIY cutting tool. On the average how long does the twin blades last, and how often do you have to use the lubricating sticks.